I confess that I escaped for election day (fearing the worst). I voted by post and went off to Italy where I had arranged to see some more of the key things I want to discuss in my ’emperors’ book’. You will, I warn you, be hearing about a few more of these (as it was a most amazing three days). But let me start with one of the added extras, one of the surprises that these visits often bring. 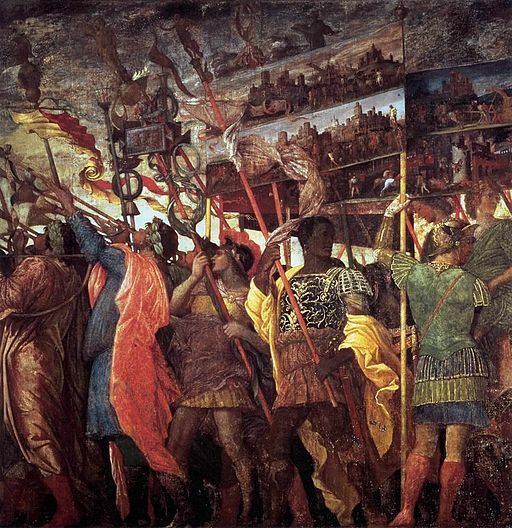 I am for obvious reasons quite interested in Mantegna’s Triumphs of Caesar, and in their later reception. And, although it wasn’t exactly top of my shopping list this time, I was aware that there was a (probably) early seventeenth-century set of copies on display in the Palazzo di San Sebastiano. 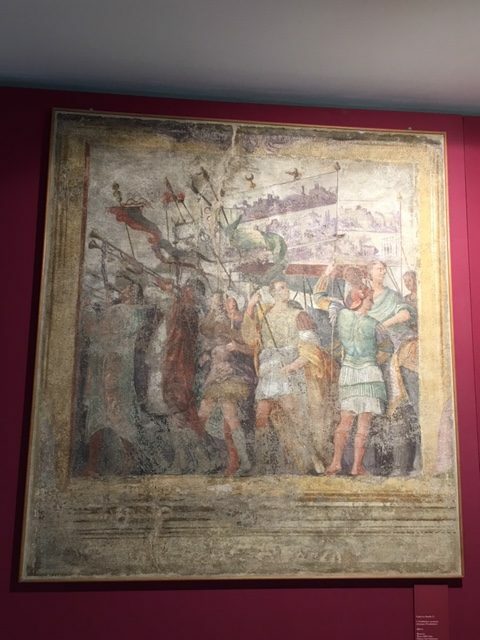 They had been discovered, as frescoes, when a large house in the town was demolished in 1926, and were detached from their wall, restored and remounted in 1936. Their history is in itself interesting (it is not really clearly who did them, or why), but for me it was a great case of how a copy can make you see the original differently. 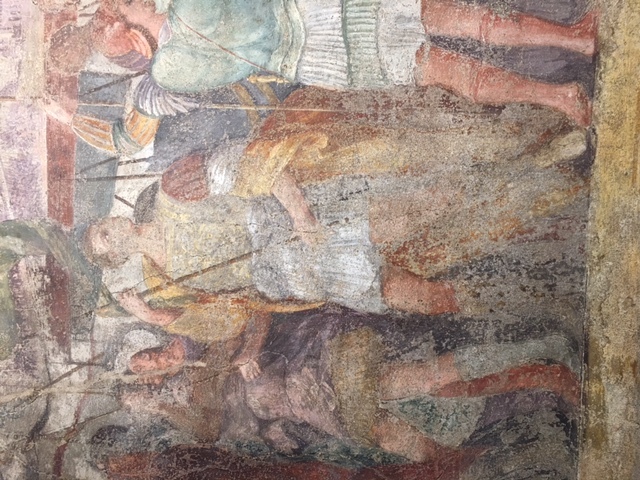 Here I was struck for various reasons by the copy of Mantegna’s first canvas, seen here in full. 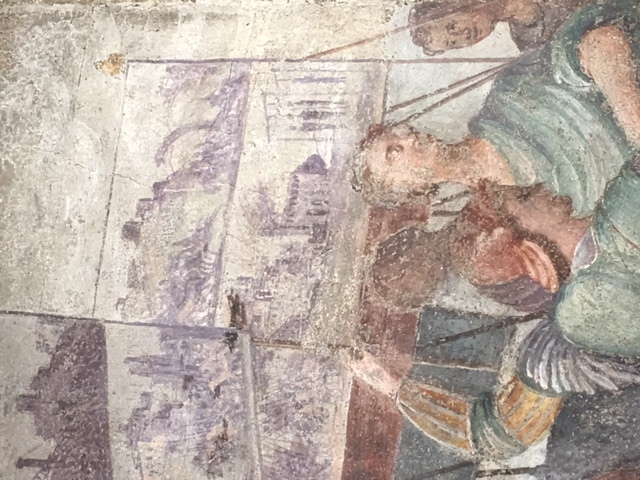 It is the beginning of the triumphal procession and you see the musicians and the men carrying the placards (as they did in a ‘real’ triumphal procession) with images of the Roman victorious campaign. It was these placards that first struck me. But the other puzzle was the guy supporting one of the placards at the front of the painting. In Mantegna’s original, this man is black. In fact, he was the cause of some controversy in the early twentieth century because when Roger Fry made his bungled attempt to restore the Mantegna originals, by then in Hampton Court, he decided to erase the black face and turn it into a white one (it has subsequently been turned back). What was striking to me, looking at these copies in Mantua, was that the man did not appear black here either. Now, it is possible that the colours have faded (his dark armour, as at Hampton Court) does not appear very dark either). But there is absolutely no sign that the man’s legs are of any different colour from those of the rest of the soldiers. Did the seventeenth-century copyist also eradicate the one black man in the whole sequence. Or (and this is my hunch) did those restorers in the 1930s (not a time in Italy when racial diversity was being celebrated) take exactly the same line as Fry for whatever reason. One suspects the reason, in both cases, was one that we would not feel very comfortable with now. Previous PostMoorish (Black) Kings of Europe: Henry II (972-1024) King of Italy and Germany also Holy Roman Emperor – mena7Next PostNigerian man warns Christians to desist from destroying shrines to avoid consequences! Thank you for bringing Africa (the Mother Land) back to us. Those are two totally didferent paintings…correct?